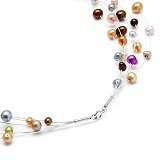 Find your ideal necklace with pearls from one of the UK's leading pearl suppliers for over 20 years. Whether you're after a bold statement piece or a dainty pendant, our necklaces are for everyone. Made with real pearls & genuine 925 Sterling Silver.